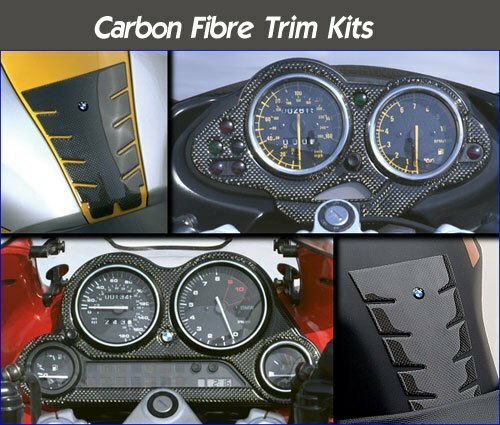 Carbon Fibre Trim Kits - It's The Real Thing ! Genuine carbon fibre for new R1200R, R1200RT, R1200ST, K1200S, K1200R, F800S and F800ST models. If you like the look of carbon fibre, ZTechnik's decorative panels won't disappoint you. Genuine carbon fibre cloth comes alive under a crystal clear, poured resin topcoat. A pressure sensitive, die-cut adhesive backing is applied to each piece that safely but securely attaches the carbon fibre to your bike. And ZTechnik's close attention to precision fit will ensure pleasing and professional results. 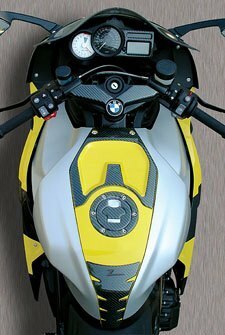 ZTechnik Carbon Fibre Accents are available for almost every late model BMW motorcycle. Different accent pieces include tank protectors, fuel cap trim, and gauge panels -- each specifically designed for your particular bike.